Pembrokeshire is a great destination if you are considering a UK holiday. With a beautiful coastline, dramatic views and a lower-than-average rainfall rate there is plenty to enjoy for all the family. Pembrokeshire is the perfect place to stay, and in our opinion there is no where better than St. Davids. If you’re visiting Pembrokeshire you really should make the most of the fabulous coastline. There are plenty of local companies who can help you to explore. Whether you want to try your hand at surfing, have a kayak around the coast, or try Coasteering – Pembrokeshire’s favourite activity which requires participants to scramble, swim and jump over our beautiful coastline, definitely one of the most fun and effective ways to explore! Set off on a Thousand Islands trip to land and go around Ramsey Island. An RSPB reserve that’s just a stone’s throw away from the St. Davids Peninsula. Take a picnic over and see if you can spot the wild deer, rabbits, seals, residential porpoise and all manner of sea birds. The friendly wardens Greg & Lisa will meet you off the boat and treat you to an informative talk about the island from which you’ll be left to your own devices to explore this magical island. For more on this great RSPB reserve go here. Visit the birth place and home of Henry VII. Pembroke Castle often host events which are catered for families so make sure to look at their website and find out what’s on offer during your stay. But even without the added bonus of events Pembroke Castle is a great day out. Eat your picnic in the luscious green courtyard, or buy it from the cafe, and enjoy the exhibitions, wax works and ancient cave underneath the castle foundations. Watch out for the dungeon! Find out if there are any events on during your stay here. We’ve been nominated and received awards for our coastpath several times. There are 186 miles of it – not that we are suggesting you walk it all! However circular walk can be mapped out on it for almost every level of walker. Whether you’re a hardy rambler or a gentle stroller our coastpath caters for every level of difficulty. If you are looking to walk the whole of the Coastpath Ocean Haze provides self-catering accommodation and Bed and Breakfast accommodation and is a great place to stay in St. Davids with perfect access to the Coastpath. An ideal place to stay if you’re planning to walk it all. For a selection of different level walks go here. You don’t need to go far to have a great day out though! Just a few minutes stroll down the road from Ocean Haze you’ll find yourself in the heart of St. Davids where you can enjoy history, a drink, food and shops. Have a look at our Medieval St. Davids Cathedral, enjoy the Bishops Palace at your leisure, enjoy one of our local pubs, and eat an ice-cream from one of our excellent ice cream shops. We also have a farmers market every Thursday on the Cross Square which is definitely worth a look – the Trehale Stand does a great pulled pork roll! Ocean Haze the a perfect place to stay in St. Davids to enjoy all this, and more! On your visit you’ll be surrounded by the sea, we have 186 miles of coast surrounding us. We celebrate it here with the Pembrokeshire Fish Week. However if you are visiting outside of 28th June – 6th July then you will still be able to taste the wonderful harvest of the sea. Head into Solva where the local fisherman sell tasty seafood treats, such as fresh Lobster and Spider Crabs. 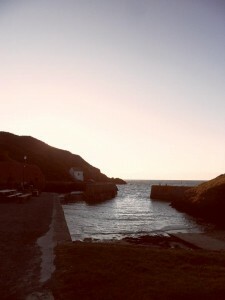 Or go for some great fish and chips in Letterston, or bistro fish meals at the Shed, in picturesque Porthgain. Find out about Fish Week here. Bosherston Lily Ponds are a perfect day out for everyone. These National Trust gardens are a set of decorative ponds situated very close to the coast and the beautiful Barafundle Beach. Even outside of Lily season this is a spectacular short walk and we do recommend heading over to Barafundle to make it a great day out. Watch out for the Otters and other animals – you and your family could make it into a game! Find out more at the National Trust website here. The Oriel Y Parc tourist information centre, just down the road from Ocean Haze, host a range of great family events and activities and one of the best of them is the regular Bat walk. Follow your guide round historic St. Davids, explore the Cathedral grounds at night, bring your torch and find out about these bats’ unusual habits. More about the Oriel Y Parc events here. Oakwood is considered by many to be Wales’ No.1 Theme Park. It might not be as big as Alton Towers, or as kitsch as Blackpool Pleasure Beach but it is a great day out for the kids. With loads of fun rides it’ll be sure to wear them out, to get them ready for a good nights sleep – Be sure not to miss Drenched! We would recommend taking your own packed lunch for this day out as food options are limited. For more information go here. Hilton Court is one of Pembrokeshire’s best kept secrets. Located on the St. Davids – Haverfordwest road, it is a beautiful and peaceful landscaped garden, with solar dome, lakes, restaurant and tea room. Its a tranquil haven where adults can sit and sip tea and children can run around and climb trees. To see what else they have on offer look here. If you’re looking for a place to stay in St. Davids, whether it’s for Bed and Breakfast accommodation or self catering accommodation we at Ocean Haze can help you plan your perfect Pembrokeshire holiday. Ocean Haze provide great holiday accommodation for parties and families of any size and just look at how much there is to do here! We’ve just given you ten fun activities, and that’s just the tip of the iceberg. With so much more to do you’d be mad not to want to explore the great Pembrokeshire coast! Contact us NOW for more information on places to stay in St. Davids, self-catering accommodation in St. Davids, and Bed and Breakfasts in St. Davids.